We were waiting to announce this for some time, now it's official and we can share our excitement for what is arguably the biggest and most unique live event in Nosound history. 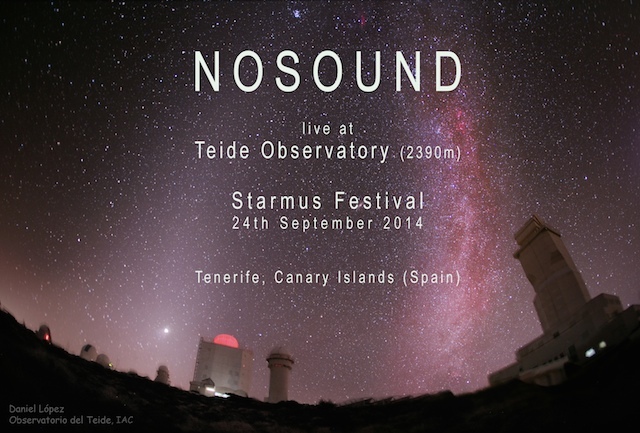 There are no words to describe what means to play at Teide Observatory for Starmus international astronomy festival, where also Rick Wakeman and Brian May will play, with an advisory board that includes Peter Gabriel as well, and with prominent figures from science, culture, the arts and music like Stephen Hawking and Richard Dawkins. Counting the days to the 24th September..more details can be found on the Facebook Event Page and the Starmus Festival, more to come soon..! There are not many words when music is speaking. 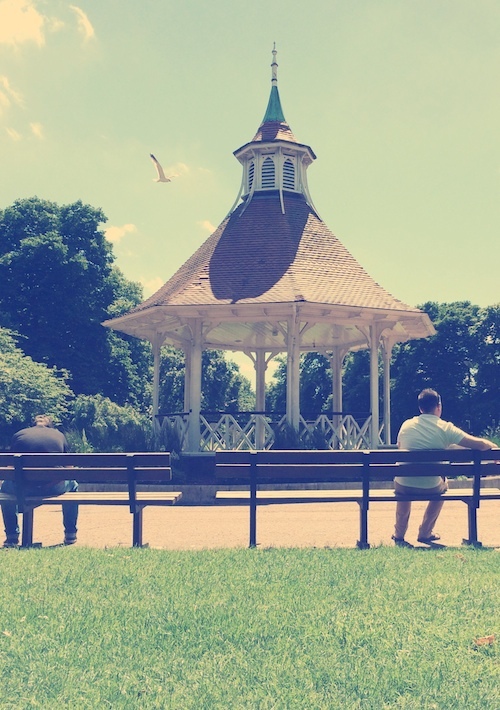 When I told Alec Wildey about something I had in mind for a new Nosound track and we discovered that he actually wrote a poem with the exact same title and concept, we both knew we were on something special and meant to happen. It's an exclusive preview of the works in progress for the new Nosound album, and most of all a way for all of us to support all people like Alec fighting a hard battle, and hopefully to learn as well something from them. A celebration of life indeed. Thanks again to Alec for writing such highly evocative and powerful lyrics. In all honesty without his words this song would not exist, they were the real inspiration behind it! 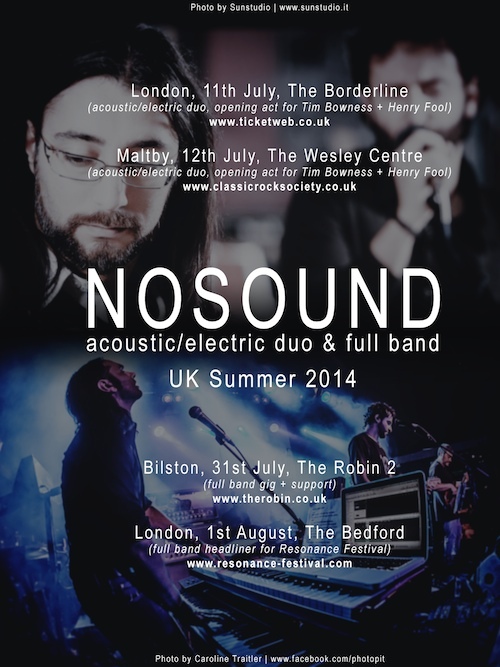 Tickets for the full band gigs of 31st July & 1st August are also available on Nosound Official Store! After last summer's Kscope gig we're really excited to come back in UK, playing NOSOUND music in duo like on 'The Northern Religion Of Things' album, and again as full power band but this time with a full extended setlist! More details coming in the next following days, but it's already possible to buy tickets for all the gigs! We're still deciding what will be the setlist for both formations..we can't promise anything, and we have a few new songs we'd like to play from 'Afterthoughts', but we'll take into consideration your suggestions: reach us on Facebook and Twitter and leave your comments and suggestions. 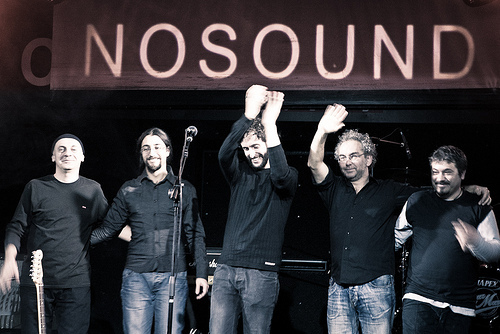 We are happy to announce that first half on next year should see a new studio album from Nosound ! Still untitled but with a few tracks already demoed (and many more already written! ), it will be the result of a more cohesive work between the band members, with very special guests to give it an even more different edge. In the meantime, between the flow of ideas, we are at work on more imminent things as well! One or two releases between now and the new album, 4 gigs this summer (duo and fullband!) in UK, some more ideas for a minitour, live album..
2013 was arguably the best year so far for NOSOUND in terms of releases and feedback. First half of last year we released our new studio album Afterthoughts, the best selling album in the band's history, featuring Chris Maitland on drums and for the first time vinyl and dvd-audio high resolution surround formats. Later the same year we reissued our second album Lightdark, in a remastered/repackaged version including a limited white vinyl and dvd-audio high resolution surround formats. We also played some key promotional shows on radio and tv that helped greatly gaining some more visibility. Once again we'd like to say 'Thank You' to all of you, old and new fans, we're here thanks to your amazing support buying our albums, interacting with us on social medias and sharing your thoughts about our music. Back to present, the end of 2013 and first months of 2014 were busy with some work in studio finalising demos and material for new a new album that will see the light tentatively early next year. At the same time we're trying to work on the live side of things to bring the band live on stage. 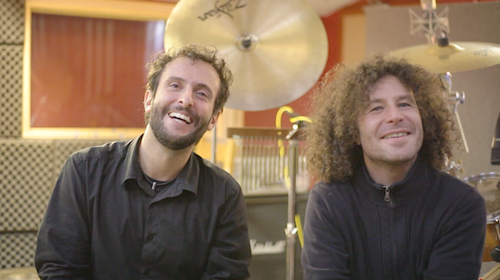 Giulio Caneponi on drums and Marco Berni on keyboards added loads of new inspiration and fresh energy in the band personal and musical mix, and we all can't wait to publish soon the first confirmed news/dates..stay tuned! 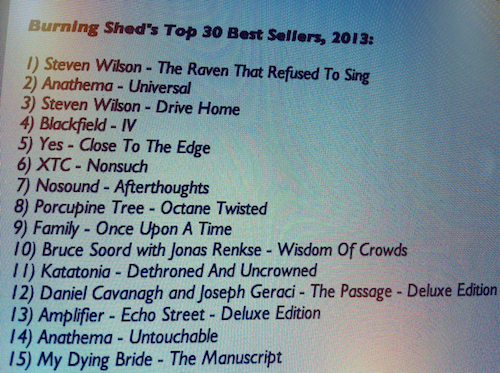 NOSOUND is in Top10 overall and Top5 Kscope artists best seller on Burning Shed in 2013! 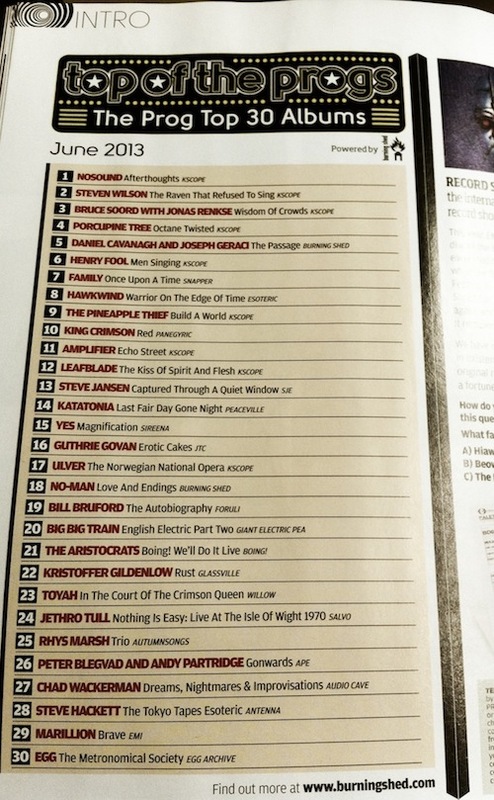 With June's No1 on Prog charts this marks a fantastic year for Nosound. We'd like to send our most heartfelt thank you to all our fans: you supported us and waited for the new album for over two years. We worked hard to deliver what we consider our best album to date, the reaction was overwhelming and showed us we're going towards the right direction in our endless journey with you. There are big plans for next year, and more news and free exclusive material to come for the Festive season..follow us on Facebook and Twitter and don't miss these out! 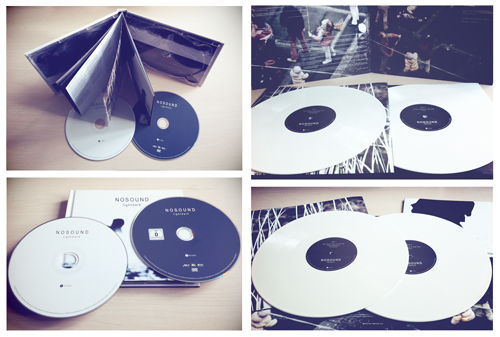 Lightdark 2013, preorders are now open on http://store.nosound.net/ for 25th November 2013 release and shipping! As part of the Kscope 5th anniversary celebrations, Nosound's breakthrough second album Lightdark has been re-released on heavyweight double white vinyl in a gatefold sleeve plus download card, and a deluxe 2 disc (CD+DVD-A/V) in rigid digibook with new 24 pages photographic booklet. This reissue is completely remastered and includes for the first time new high resolution stereo and surround mixes. The first batch of preorders of vinyl and cd/vinyl bundle will get also a free signed A4 litho print! Talking about free goodies, for the promo campaign there's a new mini website http://www.lightdark.net/ where is possible also to download Kites remastered in mp3, high resolution and surround. The summer was busy between promotion activity, tour planning and studio work for a very special release by Nosound for this winter. Vinyl test pressings arrived and approved, vinyl is already in production and very soon more details will be disclosed and preorder campaign will start..
And if you want to read more about the evening, there are a few reviews already online on Metal Recusants and Prog Sphere! Nosound new fourth studio album Afterthoughts is now available worldwide on cd, dvd-v/a, vinyl 180gr and on main digital stores and streaming services. 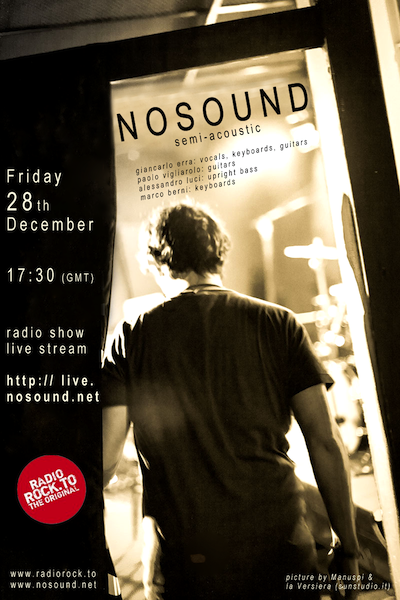 And if you want to download it, follow Nosound on Twitter (@nosoundofficial) and you can download the track for free. 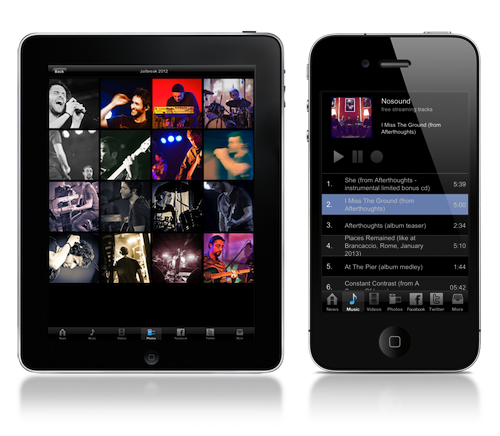 With the new album release we also updated our app, now supporting retina displays, real time news and notifications from the band, new exclusive audio/video/galleries, updated and fully searchable biography/discography and lyrics, real time connections with our social networks and much more, all constantly updated. Check it out and get it for free. In the last year we expanded a lot of our social presence and we're in direct contact with thousands of fans, it takes time but we want to continue doing this so we prepared this new website, richer than ever with free audio and video content, lots of galleries, detailed info about the band and the project, complete discography, all albums lyrics, always updated news and links to all our social networks to get last minute news and be in direct contact with us. 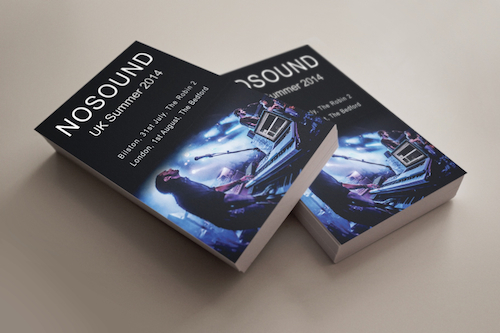 A new chapter in Nosound history is starting today, welcome aboard! "The clarity which reins supreme on the mix of this new album points the compass in a new direction...No afterthoughts or worries on this album. It is another stellar performance. Don't miss this latest chapter in the story." "Despite its bleak subject matter, the record is a life-affirming experience, and few other albums have ever matched its magnificent combinations." "You can never underestimate music like this as there is a lot to be heard beneath the surface." "April is very early to think about my album of the year list, but with Afterthoughts Nosound has set the bar pretty high indeed... Afterthoughts comes highly recommended indeed." "The work of Nosound is a must-own for any person celebrated this current return of prog music or any real lover of any kind of music." 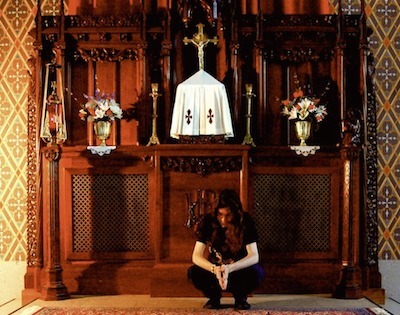 "A perfect album to get to embark on a journey deep thoughts. I would see it as the perfect complement to Anathema's Weather Systems." 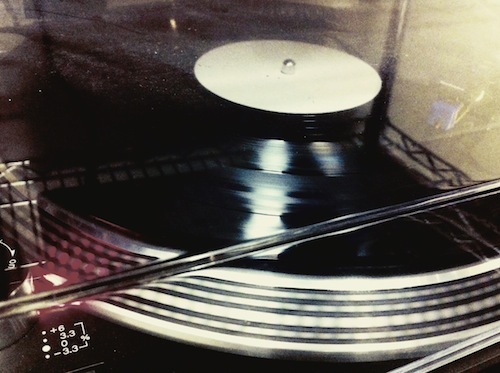 "Nosound is a genre in itself. If you're not too addicted to adrenaline, discover this album, you should like me succumb to its charm." "If you like Nosound without hesitation you can buy the new album, because you will not be disappointed. And if you had no contact so far with this band, it's worth looking around for some samples, because you can lose a good music. For me the big 5-Star." 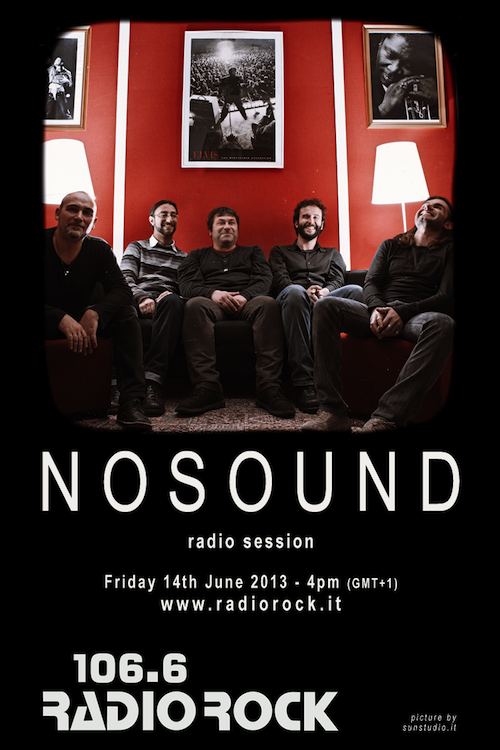 "An Encounter with NOSOUND": part 1/3 of a long video interview (in English) filmed in Nosound studio in Rome by Stefano Fasti. An in depth analysis of Nosound history and new album themes. 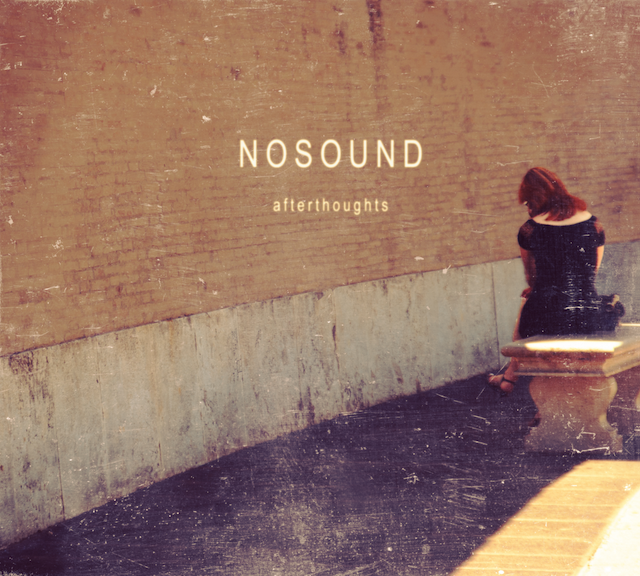 Nosound new fourth studio album Afterthoughts is available now for order! Visit the new promo mini website http://www.kscopemusic.com/nosound/afterthoughts for free download track, photo gallery, music and video, desktop/mobile wallpapers and more. The 2 disc edition features the stereo mix of the album on CD plus a DVD-A/DVD-V (NTSC 16:9, Region Free) with stereo and 5.1 surround high resolution 24bit / 96kHz mixes, plus DTS and Dolby Digital 5.1 surround versions. The first 500 pre-orders of the album from the Kscope store will receive a bonus CD featuring instrumental versions of all the tracks on the album. The double vinyl edition of the album is pressed on heavyweight (180gm) vinyl and packaged in a gatefold sleeve with printed inner sleeves. The first 500 copies will be signed and numbered and come with a free cloth bag plus a bonus CD featuring instrumental versions of tracks from the album. All copies ordered from the Kscope store contain code for the download digital version of the album. Featuring Chris Maitland (formerly Porcupine Tree) on drums and Marianne De Chastelaine on cello. Available soon for preorder in digibook cd/dvd-a/v with hi-resolution surround mixes, and limited 180gr hand numbered/signed double vinyl with digital download. All preorders will include additional instrumental cd. Vinyl preorders will also include exclusive Nosound printed cotton bag. 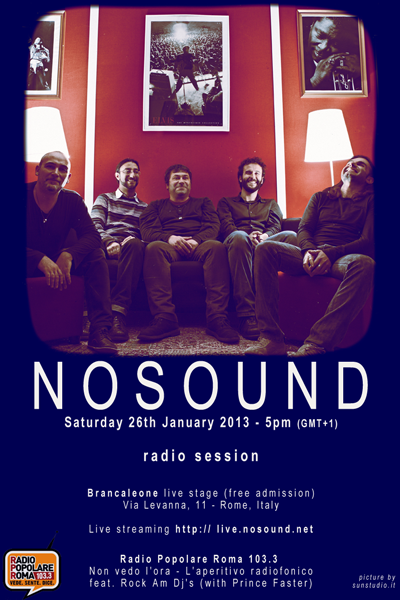 After several acoustic and 'semi-acoustic' shows in UK & Italy, after releasing the new EP 'At The Pier', NOSOUND take a break from new album's recording sessions (with Chris Maitland, ex Porcupine Tree, on drums) for a full band gig for Radio Popolare Roma at Brancaleone live club. Entrance at club is going to be free, and the gig will be streamed live online from http://live.nosound.net or http://www.radiopopolareroma.it/ascolta (gig start h 18:00 GMT+1). The gig will also be recorded so we'll need all your support..join the event on Facebook, follow the gig online and if you're in Rome just come and join us for free! It's free and live from all over the world, using the standard platform Ustream available on all computers and also on most smartphones and tablets. Join us on this event on Facebook and live with your comments during the gig! The band will play an 1h set including tracks from all previous albums and from the just released EP At The Pier, with the music re-arranged for this particular lineup. 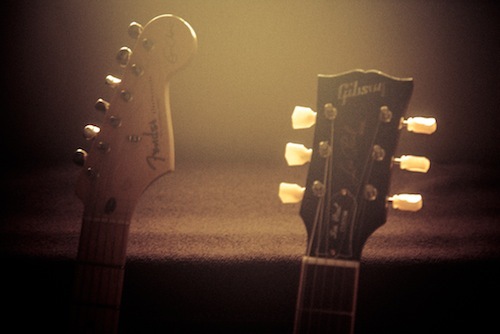 We are currently working on our new album, which will be released in early 2013. Ahead of this release comes At The Pier, a new EP which features three brand new tracks from the new album material, plus some exclusive content. For all the new material on album and EP we are joined by Marianne De Chastelaine on cello and Chris Maitland, formerly of Porcupine Tree, on drums, who adds a new dimension to the Nosound dynamics through his powerful and inventive drumming. 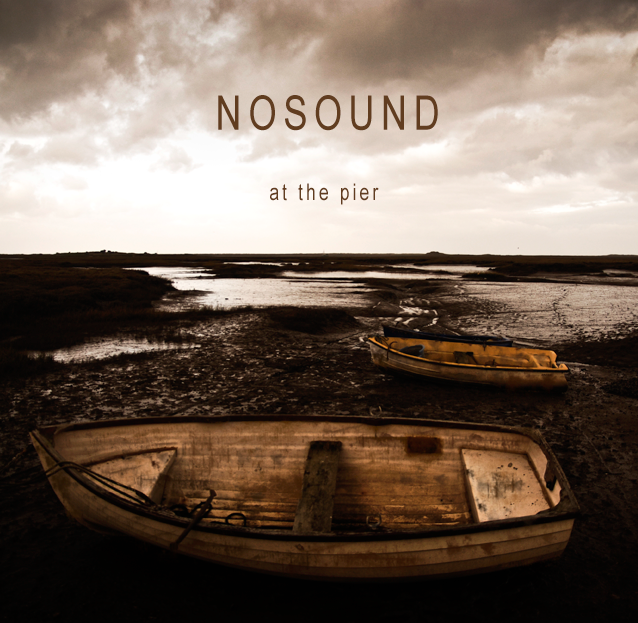 At The Pier is a strictly limited release and all pre-orders will receive an exclusive Nosound guitar pick (1.0mm) until stock lasts! To celebrate the release of the new ep the band takes a short break from the work in studio for a 'semi-acoustic' gig in Treviso (Italy, 30/11/2012) as a trio. The setlist will include music from the new ep, from The Northern Religion Of Things and from previous albums, all re-arranged for this new lineup. 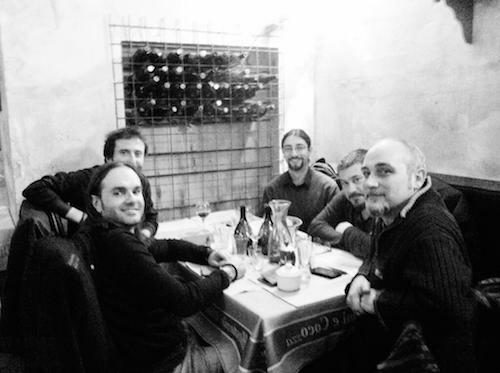 During the writing and recording of the new material, Nosound as an idea has gone through several changes, and somehow so have Nosound as a band. 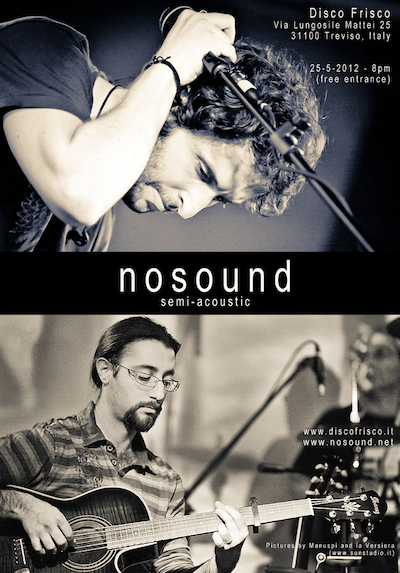 Paolo Martellacci (keyboards) and Gigi Zito (drums), two long time friends and fantastic musicians, for both artistic and personal reasons decided to follow different ways than Nosound. As much as this makes me sad for both personal and artistic reasons, I'm also happy they'll have more time now for their other projects and also to feed more our friendship that goes beyond the band. We wish them all the best, knowing that their mark will always stay with us and on what we have done together. At the same time there's always something exciting about new directions and beginnings, and this was very palpable during the final stages of working on the new material. 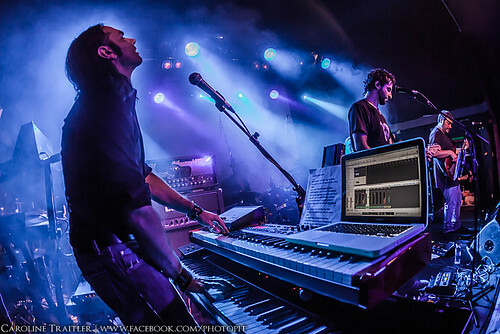 I'd like to welcome Marco Berni (keyboards) to Nosound...he'll be the new man behind the keys, buttons (and sliders!) for all our sounds, as well as try new ways to play all the parts and guide all the volumes with only two hands and two feet. He started building a custom 'Nosound hardware controller' to make the task easier..and that's just the start! And we'll introduce to you very soon the man behind the drums on the new album material.. although he won't need any further introduction..
Electric guitars together with piano are going to be a big part of the sound of the new album.. Writing and all demo are finished, recording will start in September and the official plan is a limited edition EP released in November (containing new and exclusive material) and full album following early next year in cd/dvd and vinyl. New videos will be included in the EP and the album, and new official merchandise will be available as well! 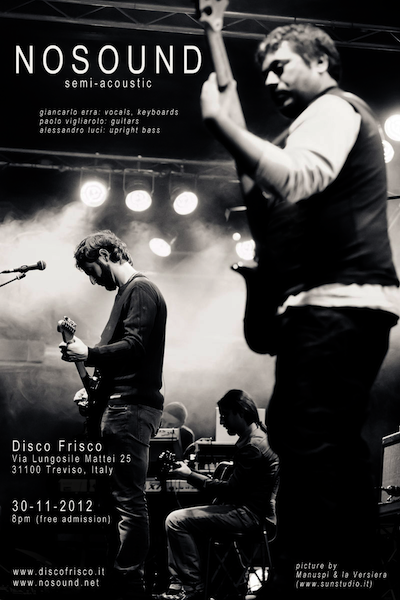 The great guys from A Liquid Landscape will open the gigs for us, and we are really looking forward to meet some of you there!